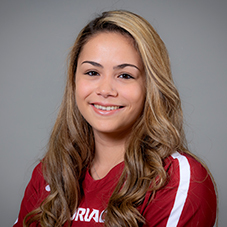 AVCA All-South Region Team…first libero to earn all-region honors since 2013 and is the 13th Razorback to earn multiple AVCA postseason honors…SEC co-defensive player of the week (10/22)…appeared and started in all 28 matches…fourth Razorback to recorded at least 500 digs in a season and first to do so since 2013…only athlete in program history to average at least 5.0 digs/set…recorded 546 digs to lead the SEC. her 5.30 digs/set average ranks 28th in the NCAA…set a career-high 33 digs against Alabama (11/23) to tie for second-most in program history…ends her career in cardinal and white with the second-most digs in program history (1,857). Starting libero in all 30 matches…picked up 15 or more digs in 14 matches including five matches with at least 20 digs…collected a season-high 26 digs at Alabama (Sept. 27)…surpassed 1,000 career digs with 15 digs against UCSB (Sept. 9)…enters senior season third on program’s career digs list (1,311)…opened the season with 19 digs, six assists and an ace in a four-set win over CSU Bakersfield (Aug. 25)…nine matches with at least five assists…had a season-high eight assists against LSU (Nov. 3)…tied career high with four services aces against ULM (Aug. 26)…one of four players on the team with 20 or more aces. Led the team and ranked fourth in the SEC with 4.10 digs per set…became third libero in program history to average more than four digs per set in a single season, joining Ashley Miller and Emily Helm…finished the season with 451 digs…seventh player in program history to reach 450 digs in a single season…moved into 14th place on program’s career list with 892 digs through two seasons…13 matches with 15 or more digs including seven 20-dig performances…picked up a season-high 29 digs at Alabama (Nov. 6)…tied for third on the team with 15 services aces…tied career high with nine assists at No. 4 Kansas (Sept. 3)…six matches with five or more assists. AVCA All-South Region Freshman of the Year…SEC All-Freshman Team…third AVCA District/Region Freshman of the Year in program history, joining Libby Windell (1999) and Jasmine Norton (2009)…tallied at least 15 digs in 14 matches including six matches with 20 or more digs…recorded season high and No. 3 mark in program history with 32 digs against South Carolina (Nov. 25)…third Razorback to average more than four digs per set in conference play (4.30)…averaged 3.87 digs per set overall…fourth freshman in program history to reach 400 digs in a single season and first to do so since 2004…only freshman libero starter in the SEC…led the team with 26 service aces. Valle was a recent member of the Puerto Rico Junior National Team and was a candidate for the 2013 Puerto Rico National Player of the Year after a standout performance with the Youth National Team. She helped lead Puerto Rico to a second-place finish at the U-18 Pan American Cup in Guatemala where she was rated the top service receiver in the tournament and ranked third in digs. She went on to play with Puerto Rico at the U-18 World Championships in Thailand where she led all players with 291 digs, third overall with 2.03 digs per set and 11th in reception percentage during the competition to lead her country to a 14th-place finish in the world standings.